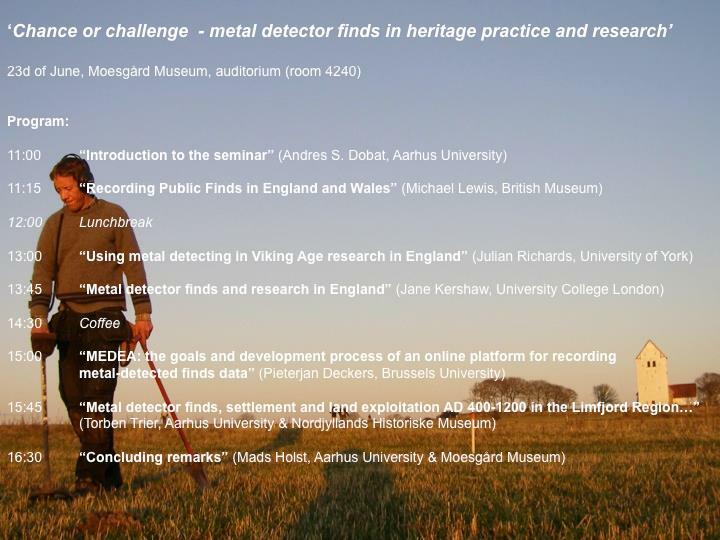 "The seminar is meant to provide a source of inspiration and a forum for discussion on how Danish archaeology is to tackle the growing number of metal detector finds in the future, and how we can exploit their full potential for research and public dissemination. Particular focus will be on the potential of central recording of metal detector finds as a basis for research. 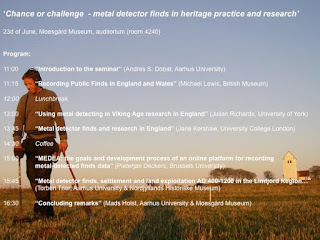 The seminar presents a selection of these projects and how they have contributed to the use of metal detector finds in research." Wonder why? With my translator's hat on, I can think of another reason, if some other European languages are anything to go by, Danish probably has no words for some of the concepts behind PAS-ism. Speakers from abroad are: Michael Lewis* and Pieterjan Deckers (editors of this), Jane Kershaw, Julian Richards (VASLE). It seems Nigel Swift and farmer Silas Brown from Heritage Action were not invited from abroad to comment. Or any British archaeologist who'll dare to go over and say what should be said about the English version of "central recording" of finds taken by artefact collectors. The answer then is a foregone conclusion, looting will be presented by PAS claquers as an "opportunity". All those coins, cunies, cylinder seals coming out of the ground and freely available for "research", innit? *What voluntary "public recording" when the PAS database is bulked out by compulsorily -reported Treasure finds and material from archaeological excavations (Bath Hoard)? You're correct, Farmer Brown hasn't yet been invited. "Interestingly most people in Denmark seemed less favourable disposed towards the English system, believing finders to be greedy and rewards too high". I trust he'll reiterate that at the Conference.